Saudi Arabia has requested a huge transfer of air-to-ground weapons from the U.S. to bolster war stocks as an insurance policy against future conflicts in an unstable region, a senior Saudi source told AIN. As notified to the U.S. Congress by the Pentagon on November 16, the proposed sale comprises more than 20,000 mostly precision-guided bombs worth nearly $1.3 billion, including logistical support. Saudi Arabia is leading an Arab coalition that is fighting to restore the internationally recognized government in Yemen. The action is named Operation Restoring Hope. Riyadh has also participated in the U.S.-led Operation Inherent Resolve (OIR) air action over Iraq and Syria. The notification to Congress described the sale as a replenishment of the Royal Saudi Air Force’s (RSAF) current weapons supplies, which are becoming depleted by “the high operational tempo in multiple counter-terrorism operations.” But the Saudi source told AIN that although the RSAF has been heavily engaged over Yemen, the total of weapons that it had expended there and in OIR is only a proportion of the total now being requested. Also included in the request: 1,500 BLU-109 penetrator warheads, 10,200 FMU-152 fuzes, bomb adaptors, nose plugs, connections and the like. The Arab intervention in Yemen has involved Saudi and UAE ground forces, which have met stiff resistance from the Houthi rebels that favor rule by former Yemeni President Saleh and who are supported by Iran. After taking control of Yemen army bases, and aided by defectors, the Houthis have fired Scud and Scarab surface-to-surface missiles. One such attack targeted the Khamis Mushait military city in Saudi Arabia, and another struck a forward operating base that the coalition established inside Yemen at Safir, killing some 60 coalition troops, among them 45 Emiratis. Saudi Arabia and the UAE subsequently deployed some of their Patriot air defense missiles to counter this missile threat, and the Emiratis deployed their hybrid Russian/German Pantsir missile system. 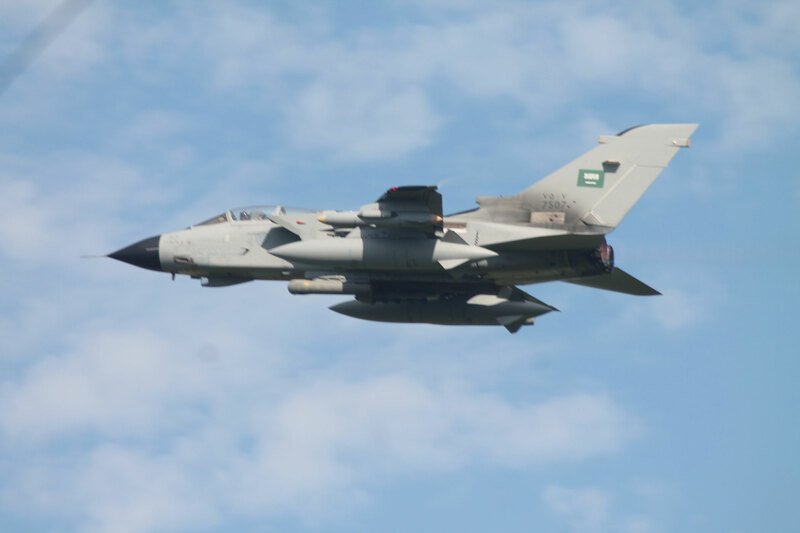 The Saudi source told AIN that the RSAF completed attacking its main objectives within Yemen a few months ago, and since then has been providing close air support to coalition ground forces, as well as to the Yemeni ground forces that are attempting to restore the rule of President Hadi. The source expressed optimism that the Arab intervention would be successfully concluded in one month.